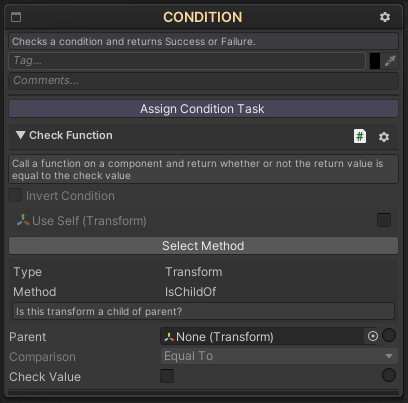 NodeCanvas comes with various Tasks that allow you to make use of existing code and components on game objects, that are well worth mentioning. 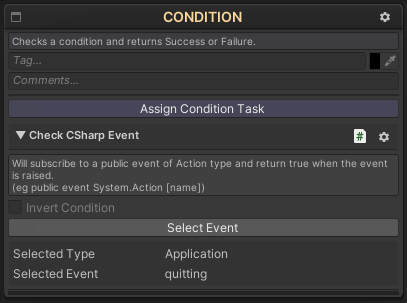 Furthermore you can keep all your implementations in your own scripts instead of creating custom action and condition tasks, and use these Script Control Tasks to interact with them in an efficient way. Following are the Script Control tasks included. 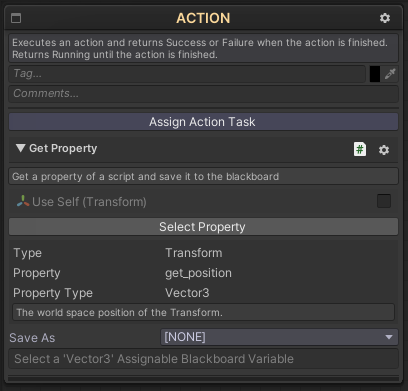 This Action will allow you to Execute a Function that takes none or up to three parameters on any Component/Script on the selected Agent and also able to save the return value of that function to a blackboard variable. The value to be used as the parameters can either be directly assigned or taken from blackboard variable. 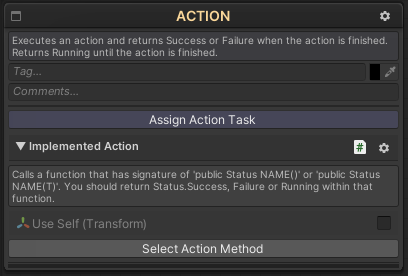 This Action ends immediately in Success unless the function selected is an IEnumerator is which case it will be executed as a Coroutine! In this case, the action will be running and only return Success after the Coroutine is done. 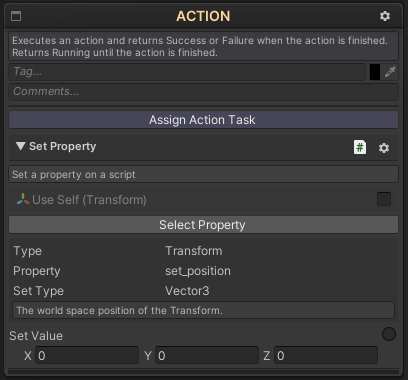 This Action will allow you to Get a property from any of the selected Agent’s components and store that property as a blackboard variable. 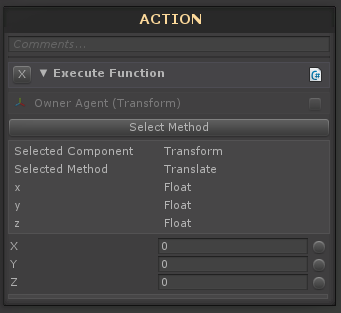 This Action will allow you to set a property on any of the selected Agent’s Components. 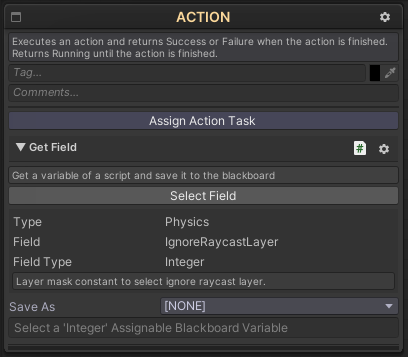 This Action will allow you to Get a field from script on the Agent and store it as blackboard variable. 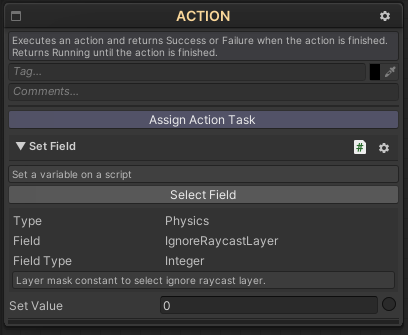 This Action will allow to Set a field on any of the selected Agent’s components. 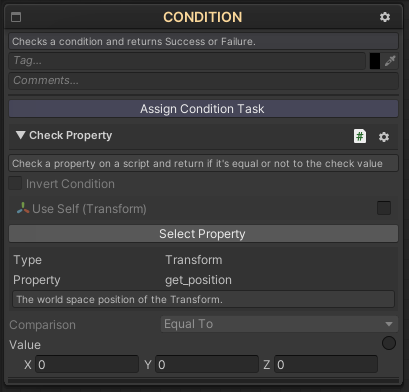 This Condition will allow you to check a boolean property directly against a value, saving you from having to first Get it and then Check it. This Condition can be used to subscribe to an event of EventHandler type or custom handler with 0 arguments and return type of void. As soon as the event is raised, this condition will return true for that specific frame.